If you have limited time. Opting for a one day photo safari is the perfect choice. If you only have a day to spare. Opting for a one day safari is the perfect option. During the winter the sun stays low on the horizon which enables us photographers to shoot through out the day and get great results. During the summer we can take advantage of the midnight sun and turn our day around. Sunset and sunrise blend together in what seems like a never ending golden hour! Below I have outlined popular one day safaris but if you have something special in mind don't hesitate to drop me a line. 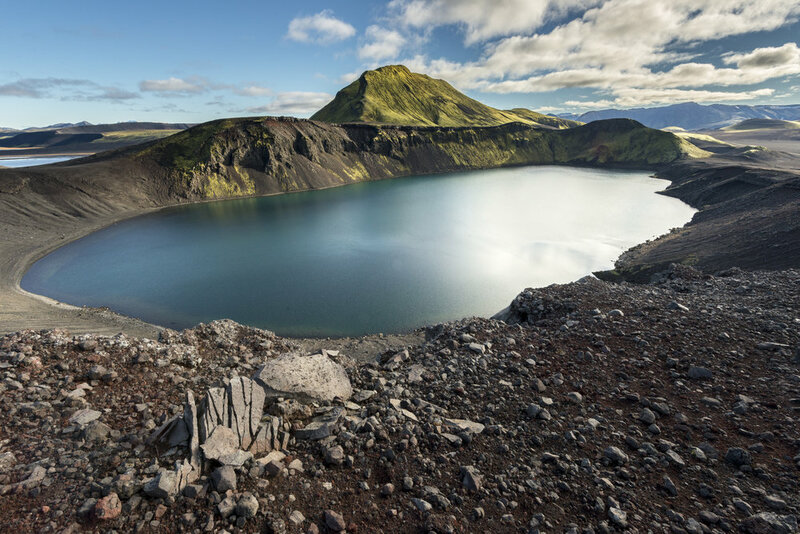 We will explore and photograph west Iceland on this 10-12 hour long photo safari. Dormant volcanos, lavafields, waterfalls and epic seascapes are some of the things you will experience on this one. We will explore and photograph epic waterfalls and black sandy beaches. During the summertime we might get a shot at the puffin along the way. Do you have something special on your mind? Hit me up with your idea! I'll design the perfect photo tour for you anywhere in Iceland. For those willing to rough it out in the wild, camping sure is the way to go. With this style of travelling we have the ultimate flexibility. Monitoring the weather we can always try our best to stay one step ahead of it. Remote places in the interior which don't have accommodation close by also become accessible to us. On longer taylor made tours we have the option to explore a little more. We can go into the interior of the country and explore magical places such as the Fjallabak nature reserve filled with all it's magic. Routes like Sprengisandur and Kjölur open up cool possibilites and connect the island from the south to north. For the ultimate ride you should delve deep into Iceland's interior. The Wild Westfjords of Iceland. If you ask me you can't find any other place in Iceland that's more Icelandic then the Westfjords. Geologically it's the oldest part of the island. Full of history but most importantly for us photographers, incredible landscape around every corner. Reflecting back on 2014 I'm torn. I have to admit that I'm a firm believer in that you can always do better. I tend to see all the flaws in my work but once every blue moon I manage to create something that I don't loath.